from THE CHICAGO TRIBUNE: At times the actors seemed to be on mountaintops, in bottomless gulches or in hell itself. 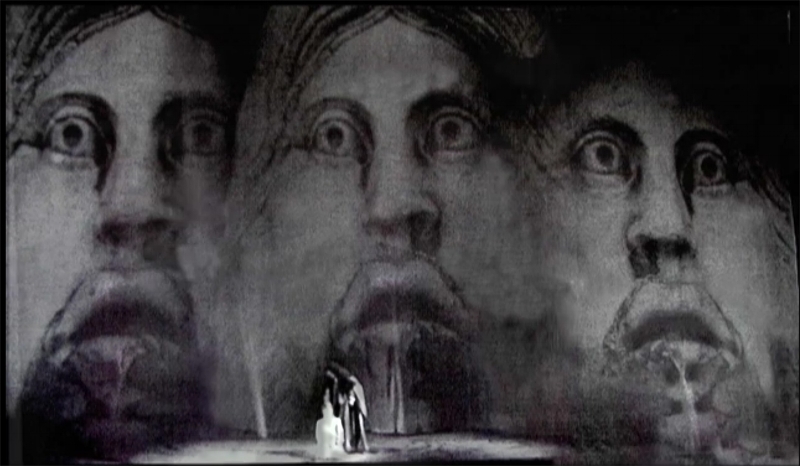 Everyone who attended the opera could truthfully say that he had never heard or seen anything like it. Initially this production was to be another collaboration between Frank Corsaro and Ronald Chase. Chase went to Europe in two trips to film for the produciton, but after Corsaro had an almost fatal automobile accident he was forced to withdraw from the production. Chase continued to organize the material, construct scenes, and make a majority of the artistic decisions for another year. Eventually, Gerald Friedman agreed to direct, using the ideas generated by Corsaro and Chase. Beatrix was a real breakthrough, because the production was concieved as a series of interlocking dreams and nightmares. It showed what could NOT be accomplished with conventional staging. The fist time we played the films in the theater with the cast onstage, the overture was accompanied with front and rear films which overlapped, similar to a three-dimensional photograph. In the center of the images, a group of singers huddled in terror while babbling about the horrors of the Cenci family history. The films showed a series of assassinations in the streets of Rome, dove-tailing dramatically between the film screens. In the scene in which Cenci was murdered by the assassins his daughter had hired, a screaming Cenci reached up and tore down a tapestry hanging at the head of his bed. (see above) At that moment the entire room began to whirl—the films moving in unison as the walls began to run with blood. Cenci fell dead as the stage floor and walls faded into a bloody tapestry. We had created something none of us had ever seen before and when the lights came up, it was one of those thrilling and unforgettable moments in the theater. The techincal staff was so overwhelmed that they ran up and down the aisles hugging each other. from THE WALL STREET JOURNAL: The films and projections carried the expressionistic staging to its ultimate of grotesque caricature, exaggeration, and power to rouse the feelings of horror and terror—the projections constantly enhancing the stage action with weird, incredible distortions. from TIME MAGAZINE: Ginastera's music was nothing compared to the multiplescreen images, slides and films of doomed faces, vacant eyeballs, writhing bodies and running women--that delved into the past, present and future like a Bergman movie gone berserk.